As it turns out, despite being even more elegant, Apple iPad Air 2 is just as difficult to repair as its predecessor. the original iPad Air received the same score from iFixit last year. The chassis of iPad Air 2 is devoid of screws, so opening it requires skill and dedicated tools. The bonded front panel that facilitates the slate’s svelte body is a hassle to pry too – it disturbs the LCD panel. Unsurprisingly, the design of the Touch ID sensor cable in the iPad Air 2 closely resembles that of iPhone 6. The newcomer’s 27.62Wh battery on the other hand, is smaller than the 32.9Wh unit of the original iPad Air. The logic board of the iPad Air 2 reveals Apple APL1012 A8X 64-bit Processor (it has three CPU cores), 2GB of RAM (2 x 1GB), SK Hynix NAND flash, and the same NXP 65V10 NFC Module as the iPhone 6. The digitizer controller is made by Broadcom. In its repairability score breakdown, iFixit gave props to the iPad Air 2 for having a battery that is not soldered to the logic board. However, fused together LCD display and glass, glued front panel to the rest of the device, and gobs of adhesive throughout, lead to the paltry repairability score. 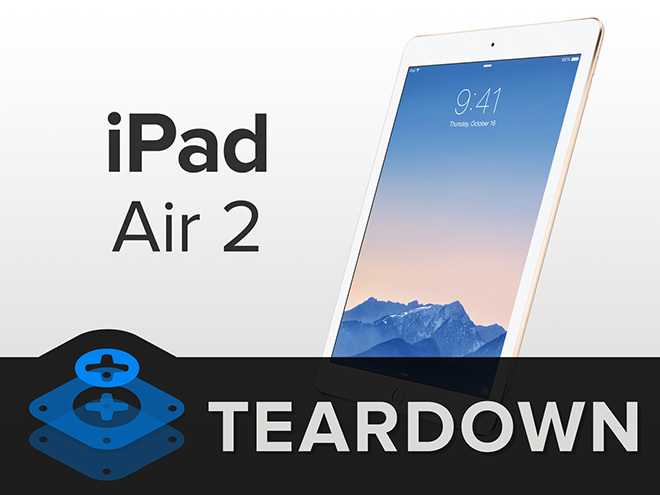 You can check out the iFixit breakdown of the Apple iPad Air 2 disassembly in the video below.